A memorial service for Larenda Hershey will be held at the United Methodist Church in Juniata, Nebraska at 1:30 p.m. on Saturday, May 31. The church is located at 610 North Adams Avenue in Juniata. You may visit Larenda’s Caring Bridge site. This entry was posted in News & Notices on May 28, 2014 by Dan Martin. Larenda Hershey, President of the Jaguar Club of Southern Colorado, lost her courageous two-year battle with cancer early Memorial Day morning. Larenda was a tireless advocate for her club, as well as for RMJC. She and her husband Dave have remained involved and been a frequent presence at nearly every event for both clubs, even throughout her illness. Please keep her husband Dave, their beloved English Springer Spaniel Buddy, and their family in your thoughts and prayers. This entry was posted in Jaguar Journal on May 28, 2014 by Dan Martin. While these warbirds are not cars, they are beautiful machines. Also, they pioneered technologies that later improved cars, everything from power trains to structures. This entry was posted in Other Events on May 27, 2014 by Dan Martin. It is with great sadness that the JCNA has learned of the passing of Bill Streitenberger, long-time member and President of JCNA at two different times. Bill held the position of Chief Judge of his club for many years and was instrumental in organizing his clubs annual Concours. In addition, Bill was newsletter editor for many years and was somewhat infamous for his selection of jokes which graced the pages of Jaguar Tales. Bill was serving as JCNA Regional Director at the time of his passing. This entry was posted in News & Notices on May 20, 2014 by Dan Martin. Among the many points we picked up at the very helpful judges training Jack, our Chief Judge, conducted today is a recommendation for two products that make a difference in how spiffy your detailing turns out. These are professional secrets I’m revealing here. Next time you see Keith, say thanks! This entry was posted in News & Notices on May 17, 2014 by Dan Martin. I am told that the CAF B-29, the only flying B-29, will be in Pueblo June 29 & 30. This entry was posted in Other Events on May 16, 2014 by Dan Martin. In 1963 Jaguar began a production run of 18 special Lightweight E‐type race cars. Only 12 of the 18 were produced, the last delivered in 1964. This left 6 chassis numbers dormant for the next 50 years. 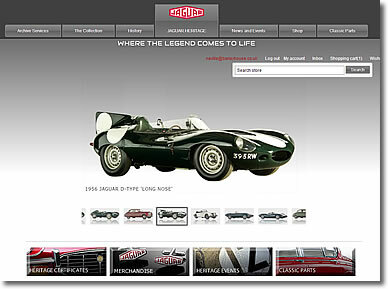 Now, the Heritage division of Jaguar is going to build the last six remaining Lightweight racing E‐types. This entry was posted in News & Notices on May 14, 2014 by Dan Martin. Doc’s Apple Blossom Meet May 9~11 in Front Royal, VA. Now in its 51st year! This is one of the oldest regional Hudson meets. This entry was posted in Other Events on May 11, 2014 by Dan Martin. This entry was posted in Other Cars on May 10, 2014 by Dan Martin. Proudly powered by WordPress Theme: Twenty Twelve Child 01.